When Get It Scrapped asked me for a page on which I had combined some embellishments in stacks, I had all kinds of ideas -3D flowers, maybe, or butterflies with decorated wings - but as I flipped through my photos I thought the best plan might be to find a picture in which "stacks" had some real meaning. And then I found one of the Berlin Wall. 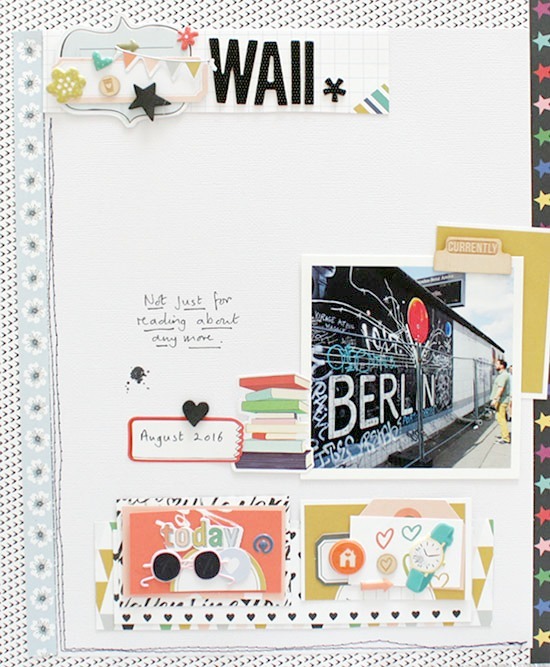 I have already scrapbooked a sizeable number of my Berlin photos. But those ones of the wall: I keep picking them up and setting them back down again. I remember the night the wall was breached. I remember a little of the before and more of the after and I understand, now, that what I knew was not nearly enough. We stood beside one of the remaining sections last summer and the tour guide began to unpick its story for us; and if I were being fanciful I might say that it felt a little as if he wanted to hand us brick after brick so that we might build up our own understanding of what it had been like, before everything changed. So I stacked up bricks with my embellishments, with the result that I saved the journaling for another page (of course I have more pictures). The layers do a fine job, I hope, of illustrating how it felt to be there, in 2016, with so much to discover. Nice layout - I really like the book embellishment against the photo which ties the words. Love how you took the challenge one step further and the meaning of this LO. Beautiful design. I love the framed border effect and those small stacks of embellishments are both beautiful and meaningful. I was in Berlin for a few hours in the mid-80s and did get a long-ish view of the wall...your LO is an excellent interpretation of "stacks" and an era long gone---one hopes---tho', who knows these days what might happen next. As you often do, you've created a wonderful layout with many layers of meaning. 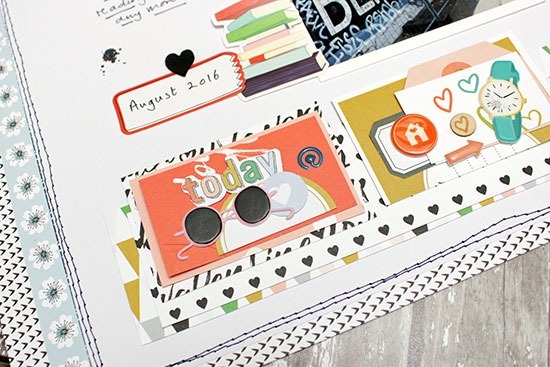 A beautiful, colorful and hopeful page - love the stacked papers and embellishments under the photo. I like the comparison. Visiting some of these places is undoubtedly an emotional experience. I recall a friend having a tiny piece of the wall that someone had given her. A tiny symbol of so much hope for the future. "I lost my bloody leg for that to happen?" Then he regained his iron control and changed the subject. His joy when it came down was wonderful. He rang me, something he always left to my mother, and said "Are you watching? the wall is coming down! at last, at last"
A perfect photo and idea for the stacked embellishments. We saw a piece of the Berlin Wall at Ronald Reagan's Presidential Library & Museum last year - it was gifted to him. Like you, I remember some of the before & a lot of the after. Very neat idea - your little stack of books, and the stacks of paper behind your 'bricks'? Perfection - sigh! Love this, just about perfect in every way.